Want some pumpkin pie for breakfast? 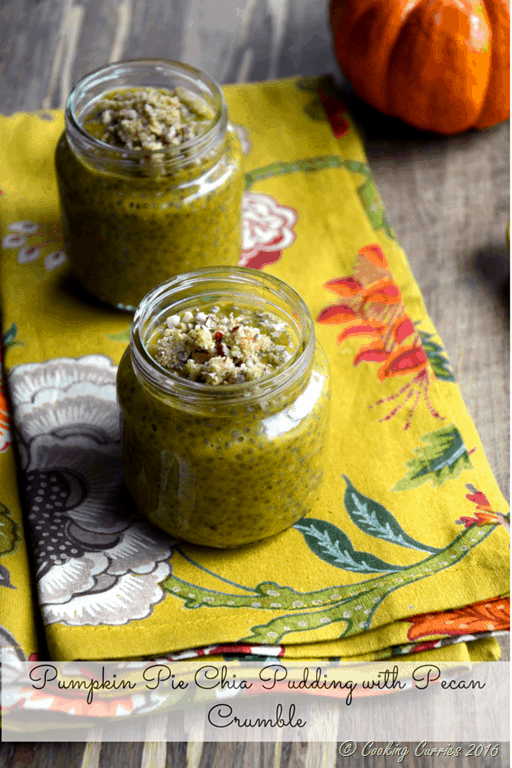 Here it is – Pumpkin Pie Chia Pudding with a Pecan Crumble made with ghee! Mornings cant get better than this! There are some of us who love pumpkin and pumpkin spice and love seeing them in everything in fall. 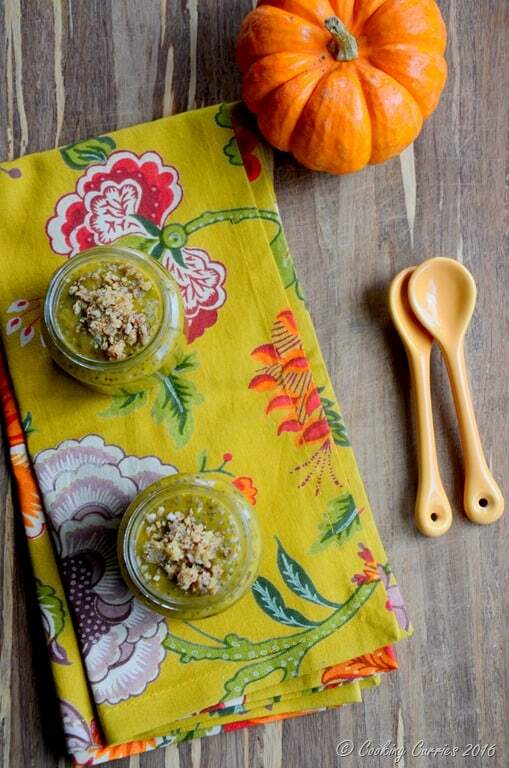 If you are one of us, then here is another pumpkin recipe. 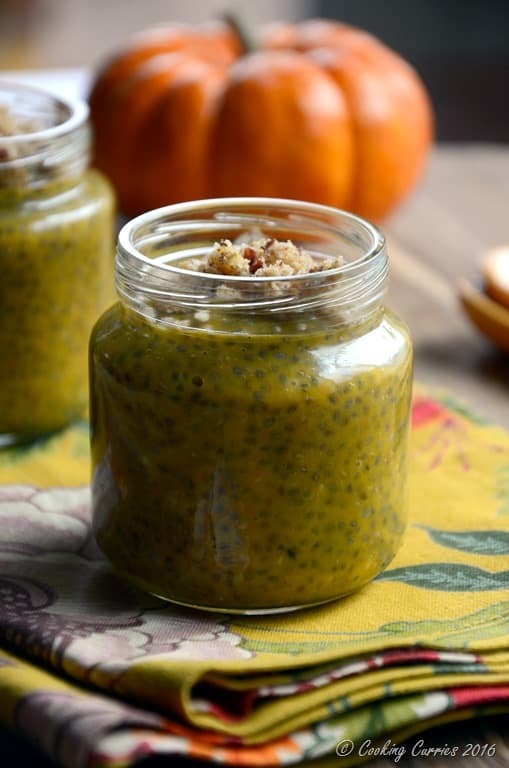 This time I added pumpkin puree to my regular chia pudding that I make for breakfast. Added some pumpkin spice, because, duh!, you need it in pumpkin pie!! Some honey (you can use maple syrup too) for a little bit of extra sweetness. I usually top my chia pudding with fruits. But since this was a pumpkin pie pudding, I thought to add the pie crust as a topping for this. Some pecans and graham crackers crushed and mixed with some ghee ( butter is fine too!) to make a crumble of sorts for a little extra crunch! Mix the 3/4 cup almond milk into the chia and keep in the refrigerator to chill for at least 20 mins or so. Meanwhile, crush the pecans and graham crackers in a mortar and pestle and mix in the ghee to form a crumble. Keep aside. Take out the chia pudding, mix in the remaining almond milk, pumpkin puree, pumpkin pie spice and honey / maple syrup. Mix well. Top with crumble and serve immediately.